Last month I had a party at my chalet, and invited Jagr and Shanny over. Who knew the entire team would show up.....well, not really. So the real story begins with my brother-in-law, Adam, waiting in line at The Hockey Hall of Fame in Toronto where our Blueshirts were signing autographs for local fans - a limited 200 people were in line prior to the Hall of Fame ceremonies that took place in November. Not only did Adam get in line (one of the last slots), but as a 'die-hard' Leafs fan (now along with Sundin and his 'no trade clause') he waited in line for 6 hours and was treated to traitor-Canadian and New York Rangers fans. Not only did he get an autograph or two, he asked every member of the team to sign this print, working over the entire table of jersey adorned Rangers. How often does one get to meet two 600 goal scorers or a Vezina nominated goalkeeper, or even, the most hated Ranger of them all, our instigator himself? He even had the guts to ask Brendan Shanahan to make his signature out "To The Dark Ranger" (see top portion of the poster). 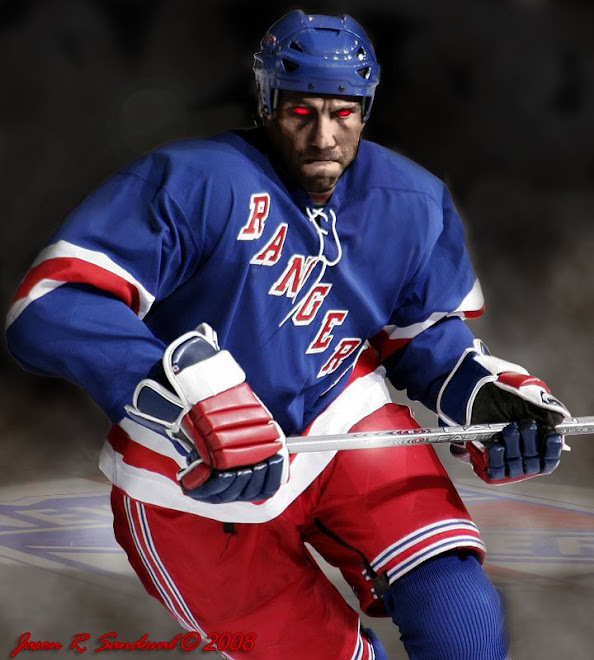 It was at that point that Sean Avery screamed out "The Dark Ranger? Ooh, that sounds mysterious!" and continued to ramble on to other victims in line. 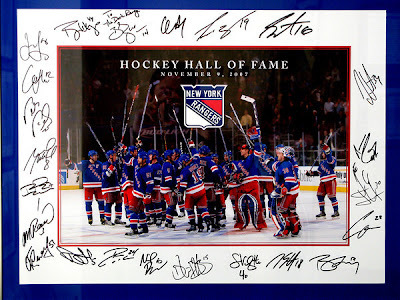 Every Ranger signed it. He then presented me with this gift last month. ...if we make the playoffs Dark! He wouldn't have waited for hours if he would have known who won the game. lol. Dude, you have one great brother in law. Where can I get one of those women with good families?!?!? Leafs vs Rangers in the first round? The Rangers were a great bunch of guys. Avery however, was...Avery! Now I almost feel guilty for dropping that neutron bomb last August on that sorry sap of a Maple Tree fan. That Maple Leaf blog was abandoned the next day. Here's the link in case you want to reminisce. Love what I'm seeing lately from the Blueshirts. Sorry I'm not blogging now. I've just been too busy. I want you to know that I always appreciated your support. No guilt, no guilt. I am sure how his team is performing gives him more worry than comments on a site. If I were him, I would have given up just around November. Poor, poor Leafs. Anyhoo, nice to hear from you Humorist...always enjoyed your posts, albeit for a short period. You'll do them when you're not so busy. In season, it takes willpower and a strong constitution to do every game, not to mention a balancing act no less. My little site is gaining viewership, which is fun -- and has led to a couple of radio interviews and guest blogging on other allied sites. Hey, if you're interested -- my wife is giving birth to our second child next Tuesday....if you're interested I need someone to cover the games this Sunday, march 9 against Boston and on Monday against Buffalo. If you're interested, I'd be honored if you 'guest blogged' for The Dark Ranger site to keep the beloved Hockey Humorist present in the blogosphere.